In a bid to support families of convicts serving prison sentence, the Kerala State Legal Services Authority has launched the Legal Aid for Socio-Economically Challenged Dependants of Convicts Scheme, 2017. The scheme aims to extend legal aid for financial sustenance, education and other social welfare measures for families left to fend for themselves after incarceration of their family member or breadwinner. 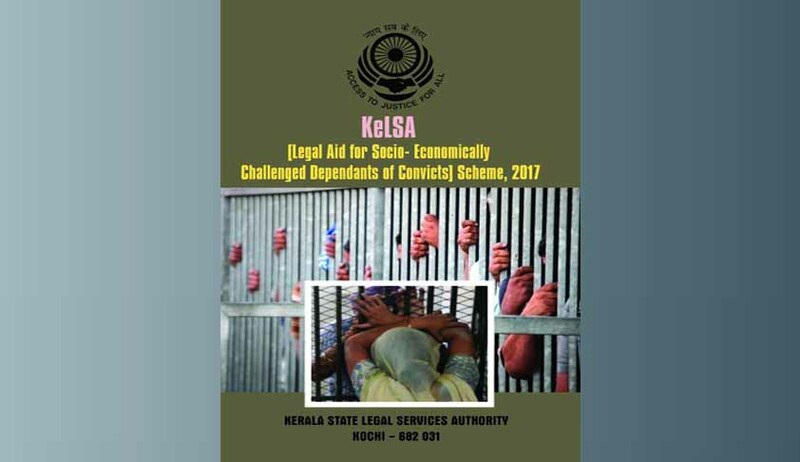 Titled KeLSA [Legal Aid for Socio Economically Challenged Dependants of Convicts] Scheme, 2017, the scheme addresses the subdued cause of economically and socially challenged dependants of prisoners, referred to as the ‘forgotten victims’. The move is aimed to provide a framework for legal services institutions in Kerala by evolving social security measures such as child protection, parents’ management, education, housing, employment, health, etc., and also to ensure effective implementation of existing legal means. As per the plan, the legal services institutions at all level shall work in coordination with government departments so as to ensure that the benefits of schemes and programmes reach the beneficiaries of the scheme. The legal services institutions would have to document each and every activity under the scheme including the data of convicts and their dependants, their social, educational and financial status etc. The spouse, children, parents et.,c shall be included in the action plan. District-level legal services authorities (DLSAs) have been designated to collect details about the prisoners and their families and other dependents and enroll para legal volunteers and panel lawyers to identify the socio-economic issues faced by them. The DLSAs shall conduct awareness programmes, publish and disseminate informative material containing the scheme details. The legal service institutions have to ensure that children of such prisoners have access to free education, as guaranteed by the Constitution. The DLSA’s need to undertake efforts to ensure their social integration, conduct part-time classes for dropouts, promote vocational training and provide opportunities and programmes for skill development and identify suitable avenues for employment. The scheme also seeks to take necessary action to ensure that the children of convicts study in mainstream schools. Keeping in essence of the Constitution and rights guaranteed thereunder, the scheme seeks to ensure that dependants of convicts are assured a decent standard of living. Access to medical care, protection against unemployment with benefits such as insurance, compensation, rehabilitation and maintenance of their dependants, are the basic facilities that must be extended to the families. The DLSAs have to liaison with the civil society in furtherance of the objectives under the scheme. It also aims to conduct Lok Adalat to resolve the socio- economic issues of dependants of convicts. The scheme calls for the legal institutions and the government to work in tandem and extend the social security measures and legislations to such families and bridge the gap between departments and beneficiaries. The legal services institutions have to ensure that all the departments and institutions are sensitised towards their social commitment to support the economically challenged dependants of convicts. The State Legal Services Authority shall persuade the government to introduce the scheme and strengthen legal services, institutional care, counselling and support services at the state, district and taluk level. The scheme identifies a list of several scheme introduced by the Government of Kerala and seeks to ensure that the benefits therein reach the beneficiaries. It seeks to instill such families with the belief that they have equal rights to get protection under government machinery and also sensitise all concerned to prevent their social ostracisation. Similar awareness programmes also would be carried out among several stakeholders to sensitise them of the rights of socio-economically challenged dependants of convicts. The scheme spells out several roles to be carried out by the legal service institutions. Apart from ensuring that competent legal service is provided to the convicts and their dependants, they have to ensure accessibility and accountability by identifying name of the authority or the officer to be approached to avail the benefits of welfare schemes for women, children and senior citizens etc. The institutions under the scheme need to take up measures to enhance capabilities at all levels, of all functionaries such as panel lawyers, counsellors, PLVs, NGOs, local bodies, police, judiciary and other stakeholders to undertake responsibilities for providing legal services to the beneficiaries of this scheme. Under the scheme, a database of government schemes, policies orders, regulations, directives etc., available for dependants of convicts shall be compiled to be used for legal awareness and provide legal services under this scheme. Underpinning the idea is the perilous conditions the families of incarcerated convicts are left in. They face economic hardships and face social ostracisation as a natural consequence of the punishment imposed on their family member. The scheme recognises and acknowledges the fact on a policy level and takes an all-encompassing approach towards the issue. Among other things, the scheme calls for coordination of government departments and creation of a platform where such dependants can voice themselves and claim their rights.